Waiouru: Jan’s a Happy Girl! After completing some work in the engine bay this morning Nick decided it was time to fit the new gas oven. The gas engineer had made three attempts to get the previous oven to work correctly but all his efforts failed. Jan had lost confidence in the model so we have replaced it with a Spinflo Prima Midi which has separate grill and oven compartments. I removed the shelf above the existing oven as the new Spinflo is higher. 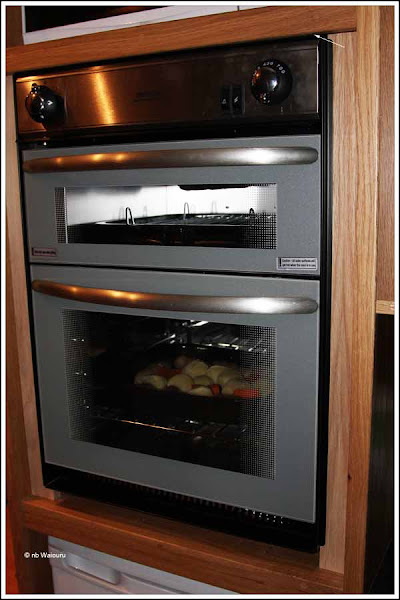 To my surprise the new oven actually had less depth and fitting it into the cavity proved easier than anticipated. Nick made the gas and electrical connections and tested everything before placing his order for cheese and sun dried tomato bread rolls. Jan is so pleased to have a working oven she will willingly bake Nick bread and scones. 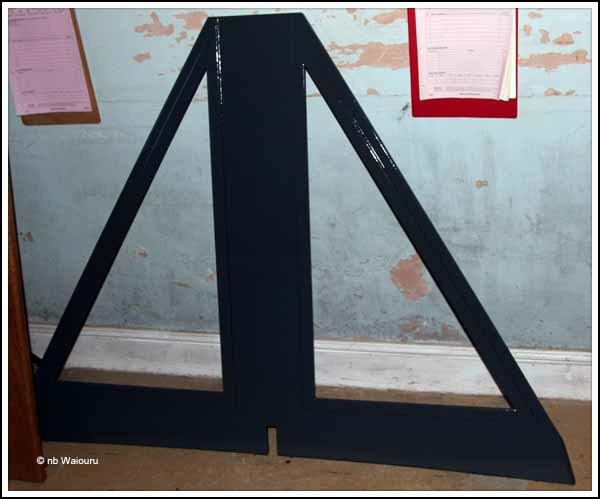 Darren has lightly sanded the cratch board and given it another coat of graphite paint. The King plank (right name?) has also been finished. James spent most of the day making pipe boxing. It’s now all completed although he had a problem with the bathroom when the pipe box was too long. He took it back to the workshop and cut 2mm off one end. It was still slightly too long so it went back to the workshop for a second time to have a hair shaved off the box. One returning to the boat he found the box was 2mm short? Quite a puzzle until he realised he’d brought the wrong piece of ply panelling onto Waiouru! 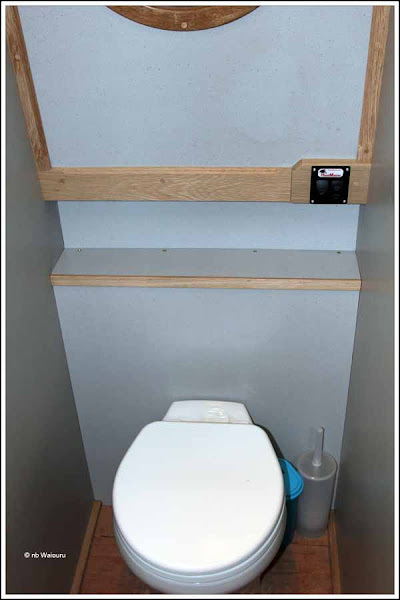 The enclosed piping in the toilet has made a significant change to it’s appearance. Jan will find the shelving on top of the pipe box very useful. 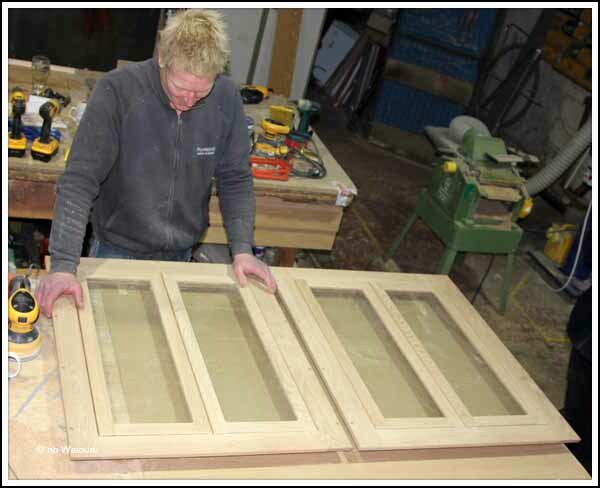 Meanwhile Richard spent most of the day making the side hatch interior framing and glazed doors. To my horror I discovered this morning that I’d only varnished half the saloon finrad boxing. The boxing for the other side of the saloon had been placed in the timber rack and I’d overlooked it when varnishing during the last two days. This means the finrad boxing won’t be fitted until Monday at the earliest. In the afternoon Nick adjusted the engine mounts and fitted a non return valve to the stern bilge pump.